Ahhhhh! How peaceful is life under the sea. Use these sea stencils to create your own world beneath the waves. There's nothing like the sound of the waves and the rush of the sea air to wash away all our worries. It's no wonder that a underwater theme is so popular. Join me as I invite a little of the beach into my home by repainting a small chest with these sea stencils which you can get in a book below! This was an old fishing gear chest that my father built back when I was a little girl. Because of those memories and because my father made this little chest I could never bear to part with it. However, I could bear to part with the army green color he had painted it. So I started to transform it with an off white base and them swept light tan brush strokes over the whole thing to give it that wind swept sandy look. The top has a seagull to bring home the beach theme and below him along the front are his underwater pals. 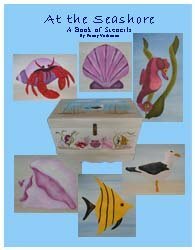 All were painted using the ocean life stencils available in the book below. They are mostly multi layer stencils which give you a more detailed image than a single layer stencil. For more on the differences of multi layer and single layer stencils go to Stencil Patterns. I painted a few wisps of sea grass around which was easy to do. Just pour a couple of different colors of green onto a palette and swirl a thin paint brush through it. Then in back and forth curvy sweeps, paint the color onto your surface. Twist the paint brush between your fingers as you paint so that the different colors cross each other and create the sea grass movement in the waves. This is a great piece for a porch, bathroom, child’s room, sun room or (if you’re lucky to live near the beach) any room. The beauty of taking on a furniture painting project yourself is that you can match the theme of your space. And stencils help you get the images in place. 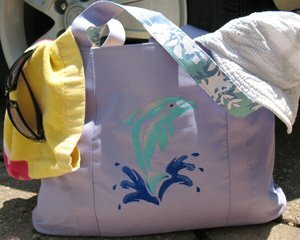 Since you're into sea stencil themes, you should see this beach bag project that I did with a Dolphin Stencil. Best yet you'll find the stencil here for free! For a sneak preview, don't miss the video below. For more fishy prospects, you should look up the koi stencils to see what they are swimming into these days! By the way, don't miss out on our many free printable stencils and ideas. We are thrilled to introduce our selection of downloadable and Printable Stencils. Instant gratification at its finest! You don't need a special printer - these designs are specially formatted to print straight from your home computer on standard letter sized paper. No waiting on the mailman and no shipping charges. Once downloaded, you will have your complete stencil booklet with patterns and instructions. Just click, buy and print! 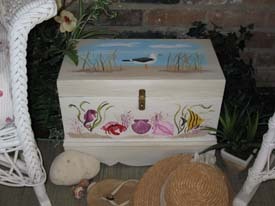 The first book below has the Sea Stencil Designs that were used on this trunk. I added two others that I think you might like to try in your next stenciling ideas. Each book will come to you as a downloadable pdf file in your e-mail. Just check your e-mail after purchase for the link to connect to your file and print or save. It's that easy! Aaaahhhh...the lazy days of summer at the beach. This collection includes the 6 sea stencils featured on this page - a Fish Stencil, a Crab, a Seagull, a Conch Shell, a Scallop Shell and a Seahorse. And hey! Don’t forget that I (and everyone else) want to see what you have done with your Sea Stencils. Just click on Stenciling Projects to get your masterpiece showcased here on this web site. Won’t that be exciting! Or if you have any questions or want to share information join in on the Stencil Blog. Well, I hope to hear from you soon. P.S. If you’d rather get your Stencil Pattern Books in Print (like these or the one above), then visit our Printer’s Book Shop for the same designs in book format that will be mailed to you. You’ll find all of the stencils used as examples throughout this site. Oh wait! Here's that project idea video I promised you. Enjoy! Return to Home Page from Sea Stencils. Return to Stenciling Ideas from Sea Stencils.